People have been connecting smartphones with robots for years and in early 2010 some Googlers started to get involved in their 20% time. 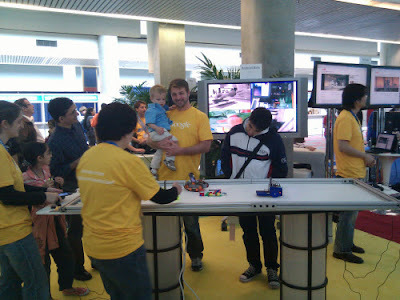 We first demoed robots from the Cellbots.com community in the Google booth at ISEF 2010 in May. It was amazing to watch how engaged the kids were with understanding how the robots worked and what technology was used for the Android phones to talk to them (hint: it’s Bluetooth, WiFi and Google Chat). In July we let students from the CAPE Program take them for a spin and the kids swarmed around the robots while making up games for them. 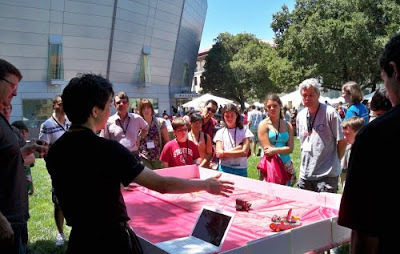 We also took some Cellbots on tour to Stanford Engineering’s 11th Annual eDay with a table of robots for everyone to play with. Then in October we showed off some of the 20% Robotics Task Force team’s work to the Home Brew Robotics Club. This time we saw children and their parents actively discussing clever ways to pair their own custom built robots to Android phones. Today we’re proud to have released some great enhancements to App Inventor for Android and open-sourced some Java and Python apps that further this concept, which you can read about on the Google Code blog. We encourage students everywhere to explore this technology and for educators to build curriculum around these fun learning tools for all ages. There’s no doubt that kids love robots and my son has had an Android phone since he was a toddler. It isn’t until we start pairing them together that something truly special forms—the Cellbot! Three cheers for the project manager! muito bom , very nice ! Sweet, Robots are awesome, can't wait to put my hands on the released software!